The European countries are committed to keep on reducing CO2 emissions and slowing down the climate change. For the individual transport system, the pure electric vehicle technology powered by “green” electricity offers a great chance for an important contribution to the protection of the environment. Resulting from low energy density of batteries and the need to offer a convenient range, the battery packs of the near future will be heavy and bulky (despite the latest advances in Li-Ion cells). 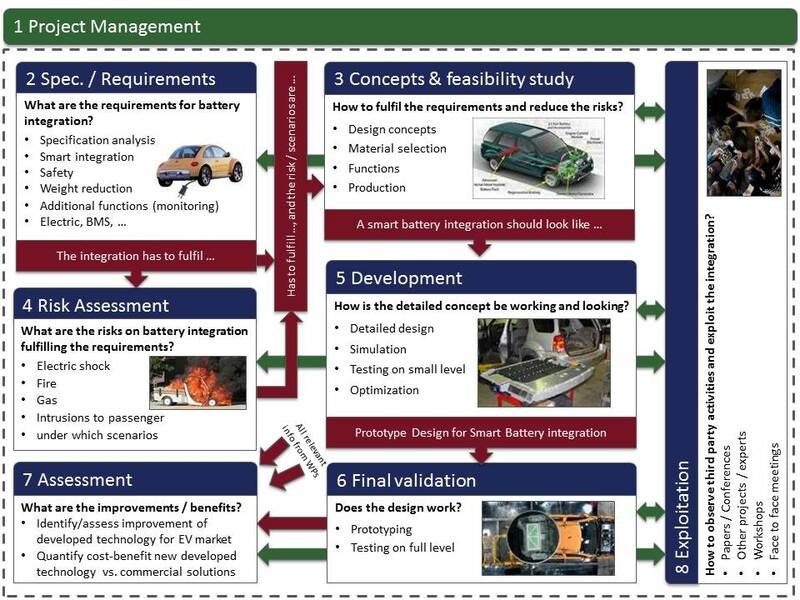 The objective of SmartBatt is to develop and proof an innovative, multifunctional, light and safe concept of an energy storage system which is integrated in the pure electric car’s structure. The main challenges of this smart integration are the combination of lightweight design with a high safety level against all kinds of hazards, the optimization of functions and the intelligent design of interfaces to various on-board systems. In order to meet the various challenges, a consortium of different companies and institutes with good reputation was formed capable of viewing on the problem from all important sides and willing to contribute with their knowledge and capacities to the solutions for this specific topic. The expertise of all partners comprises complete vehicle competence, electrics, electronics, batteries, lightweight design, engineering, materials, testing and validation. All 9 partners from 5 European countries are well experienced in running EC projects. The consortium is well balanced: 4 industrial (incl. 2 SMEs) and 5 research partners. The exploitation is not limited to the partners but results will be distributed on different ways e.g. project website, papers or trainings as well as face-to-face workshops and meetings with OEMs. As the automotive sector is a traditionally “male” dominated area the SmartBatt project aims at initiating a next step towards change. A Gender Action Plan will raise awareness of the gender dissemination and encourage women to participate in research as scientists.